I thought I'd share a couple cards using the Nestibilities diecuts today. They both use the Heart Topiary cling set. But I can make yellow roses! I colored these with my Copics and cut them out with the rectangle Nestibility die. Then I framed it with the scalloped rectangle. 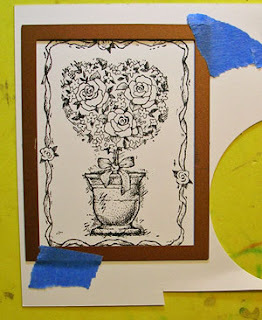 One little tip - I like to stamp first and then cut it out. Its much easier for me to center the image that way. To keep my die in place, I put tiny pieces of blue painter's tape on the die - sticking it to the paper I won't be using. This keeps me from shifting it when I assemble my sandwich and feed it through the machine. 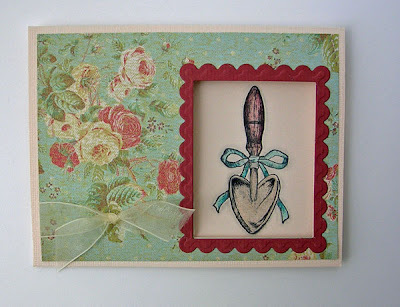 For this next card, I wanted to create a framed window for the trowel from the Heart Topiary set. I colored the trowel in this card with my Prismacolor pencils. Copic markers will bleed through pretty much any paper. 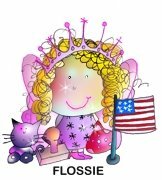 If I had used them, the color would have appeared on the back of the card in yucky splotches. 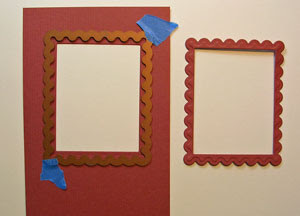 I cut my frame by first cutting the rectangle, then centering the larger scalloped rectangle around it and cutting again - using the tape to hold the scalloped rectangle in place. I ran the frame through the Wizard a second time to emboss it. Then I attached my patterned paper (from K&Co) to the card front. I used a small amount of temporary adhesive because I knew I wanted to add the ribbon. I positioned the same rectangle die I used for the inside of the frame. I taped the die in place - with the tape on the inside because that what the piece I was going to discard. 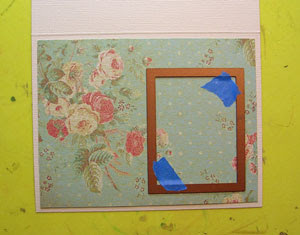 Once the window was cut, I removed the patterned paper and tied the ribbon around the left side - then glued it in place. I stamped the trowel image through the window, colored it and glued on the frame. Those are my little Nestibilities tips. Thanks for stopping by! These are lovely,, thanks for the information, did not know that about yellow roses either. Lovely cards! 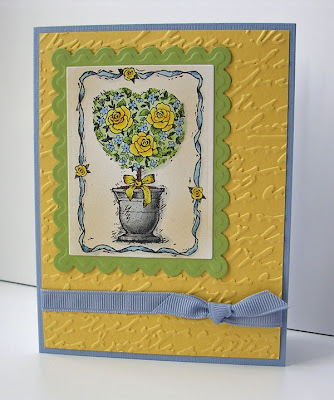 I like yellow roses as well, but I don't garden so paper ones do it for me, too! Thanks for the step-by-step on the Nestabilities. My first set (rectangles) are still on backorder - drat! so many great hints for using the nesties in this post! thanks so much for sharing. great card!